The newly elected members of Supreme Pupil Government (SPG) for S.Y. 2017-2018 officially took their oath at PISQ covered court last September 28. 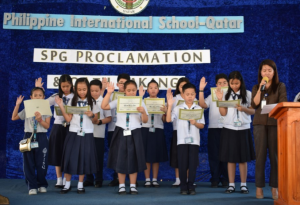 The proclaimed SPG officers were Methelyn B. Cutad, President (LEADERS); Abdullah P. Abdul-Raziq, Vice-President (LEADERS); Alexi Gabrielle G. Militante, Secretary (LEADERS); Marian Lovie A. Francia, Treasurer (LEADERS); Matt Karl Randell B. Magnaye, Auditor (LEADERS); Hyacinth Fey B. Castro and Rjay Neil D. Banas, Business Managers (LEADERS); Denver A. Jimenez, Press Information Officer (LEADERS); Maria Alessandra B. Endaya, Grade 4 Representative (Independent); Zophia Audrey J. Obejera, Grade 5 Representative, (Independent); and Antoinee Nimeesha M. Angeles, Grade 6 Representative (LEADERS) respectively. Their platform included spearheading activities for student development, raising funds to acquire additional laboratory apparatuses and creating a Facebook page where the concerns of the student body can be posted. Prior to their proclamation and oath taking, the election proper and canvassing of votes was held on September 27. Furthermore, the newly elected SPG along with Supreme Student Government (SSG) officers attended a leadership training with the theme Leadership: Precision and Performance last October 13. Ms. Kareen R. Alviar and Ms. Wilma P. Domiquel, SPG and SSG advisers spearheaded the activity under the supervision of Mr. Jason A. Iyas, School Principal. PISQ was introduced to me by Sir Edgardo “Egay” T. Basilio when we (as a family) were first-timers here in Qatar and I was looking for a Philippine School for our child. Our child started Nursery Class in PISQ and thank God, my child will be graduating from 6th Grade this Academic Year 2017-2018. No regrets of making PISQ as our child’s second home. Looking forward to see our child complete his K-12 Curriculum in PISQ. We believe that the best way in predicting our children’s future is by creating it. And PISQ led the way to make it happen. PISQ is a perfect learning environment for our kids, the students respects each other, supports each other, and helps each other to succeed. Mr. & Mrs. Cirilo C. Caday Jr.
At the end of the day, the most overwhelming key to our child’s success is the positive involvement of parents and teachers which we found here in PISQ. Arch. Jose V. Genonangan Jr.
As parents we prefer to choose for our three children to study with modern and high education fundamentals in PISQ. Gives fun activities and spread more communication through students and teachers. Mr. & Mrs. Felixberto Lloren Jr.
We sincerely thank you and acknowledge with a deep sense of appreciation your concern and dedication in providing a quality education and atmosphere for our daughter and for everybody. PISQ is a school with great foundation of integrity. The school has a supportive learning environment that takes into account of student’s interest, learning profiles and readiness. PiSQ is a school that gives serious attention to develop and nurture students personal, social and emotional needs. We have found our son’s second home, it’s the PISQ! Living in a community just a stone’s throw away from the other Philippine school, it’s a no-brainer to enrol my preschooler in it, but I chose PISQ because of unbiased feedbacks from parents, not to mention the value I get for my hard-earned money. No regrets so far. PISQ stood with us during the crisis we faced 2 years ago. The quality of education the school provides tailors to everyone’s requirements and perspective. PISQ is suitably beautiful with a heart in extending a home of creative thinking and learning. PISQ have great administration, motivated and engaged teachers, professional team, committed, friendly and welcoming staff. Philippine International School Qatar 2017 ©. All Rights Reserved.